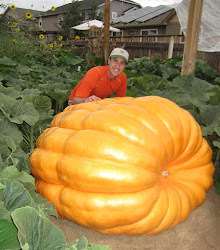 Giant Pumpkin Growing Tips From The Pumpkin Man: Weigh-off Time! This coming Saturday is the weigh-off at Hee Haw farms in Pleasant Grove. Start time is at noon. I'll be taking my pumpkin there. Certainly not my biggest pumpkin, but I really like the shape and genetics for this pumpkin. Neglect didn't give it the best chance to grow this year, but I'm hoping the improvements made this year will allow for a big one next season. May grow a seed from this pumpkin.